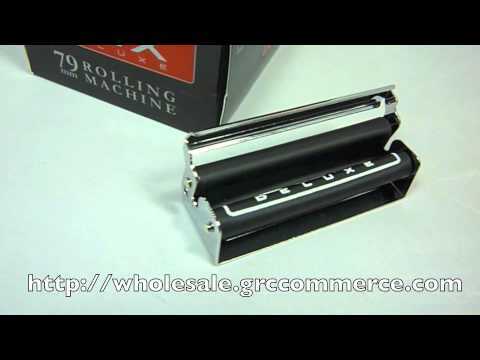 This stunning DLX rolling machine has a very nice looking body made out of polished chrome metal. These metal rolling boxes can last a long time, and they can make some amazing smokes. Fits single wide, 1 1/4, and 1 1/2 rolling papers. Even if you're all thumbs when it comes to rolling, you can easily make machine-perfect joints and cigarettes. It's also a handy accessory for the seasoned roller who wants to prepare several rolls in one sitting. "These DLX rolling machines are made out of polished chrome metal. Besides looking awesome, these rolling machines also roll awesome. Fits singlewide, 1 1/4, and 1 1/2 rolling papers. Machine rolling gives you perfect smokes, without the time or hassle that hand rolling takes."